2This text aims to articulate the mediatic relations of sound within the “betweens” of ether and ocean. It is intended to be read in conjunction with the navigation of the underwater soundscape presented by “Etheric Ocean” [http://luckysoap.com/​ethericocean] (Carpenter 2014). This web-based work was commissioned by Electronic Voice Phenomena, a Liverpool-based experimental literature and new media project exploring contemporary approaches to sound, voice, technology, and writing2. 3“Etheric Ocean” presents a Deleuzian assemblage of sonic distortions born of the difficulty of communicating through the imaginary media of ether and the deep, dense, dark media of ocean. This assemblage détournes diverse textual, visual, and audio sources from multiple disciplinary contexts. This is a world of inversions. Noises are made. Islands are heard. 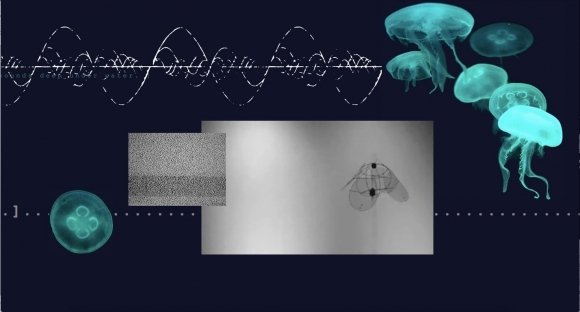 Sounds are harbours, or are they ocean depths? 4On his second voyage for the discovery of the Northwest Passage, attempted in 1586, Mister John Davis of Dartmouth, Devon, observed, “This land is nothing is sight but isles3.” On the 29th June, “after many tempestuous storms” he discovered “a mighty company of isles full of fair sounds4.” Within these sounds he sent his boats. When the sea is nothing in sight but isles, what will you do? I’ll ['water', 'down', 'fall', 'front', 'log', 'mark', 'meadow']. I’ll ['weaken', 'wean', 'wear', 'weather', 'warn', 'proof']. Until 1773, when Constantine John Phipps… began to sound the ocean bed, many people thought the sea was bottomless… During his voyage towards the north pole in search of the fabled north-west passage… Phipps employed a lead weighted line to measure the distance between himself and the bottom of the ancient sea between Iceland and Norway. That strand of hemp linked the Enlightenment with the pre-history of the earth… for a century this northern nadir remained the profoundest known ocean6. On the ['2nd', '3rd', '4th', '5th', '6th'] February, at ['1', '1.30', '3', '3.30', '3.40', '4', '4.30', '5', '6', '7', '7.30', '9', '9.30', '10', '11'] ['AM', 'PM'] the ship ['proceeded under sail towards', 'was unable to prosecute the search for', 'was unable to make much progress toward', 'bore up for the supposed position of'] Heard Island. ['Bottom', 'No bottom'] was obtained at ['80', '120', '130', '200', '300', '425'] fathoms. It was deemed imprudent to proceed further, ['because of the rocky, uneven nature of the bottom', 'on account of the uncertain position of the island', 'as the ship was surrounded by Penguins, uttering their discordant cry']8. Sounds like ['a signal', 'a sure sign', 'engine trouble']. Sounds un-like ['the ocean', 'the wind', 'distant thunder', 'the rain']. Sounds not un-like ['voices', 'whispers', 'whale song', 'dolphins', 'singing', 'sobbing', 'static']. Sounds a bit like ['an echo', 'a false positive', 'a hoax rumour', 'a harmonic'] (Carpenter, 2014). 8If you can’t hear sound here, it’s possible that your computer or browser doesn’t support the sound file format. Or, that you have your speakers turned off. Or, that you are a land mammal bending you ear to hear sounds deep under water. 9Ether is a hypothetical medium supposed by the ancients to fill the heavens, proposed by nineteenth-century British physicists to account for the propagation of electromagnetic radiation through space. 10The notion of “ocean” was once as vague. Aristotle perceived of the world as a small place, bounded by a narrow river. Columbus believed the Atlantic a shorter distance across than we now know it to be. 9 Tom McCarthy, C., London, Jonathan Cape, 2010. 'He spent his last years trying to establish contact between this world and the next']10. 13Even as early electromagnetic telegraphic and wireless transmissions propagating over, under, and through oceans appeared to collapse distances between ships and shores, they revealed vast new oceans—oceans of static, oceans of noise. 11 Tom McCarthy, C., London, Jonathan Cape, 2010, p. 63. 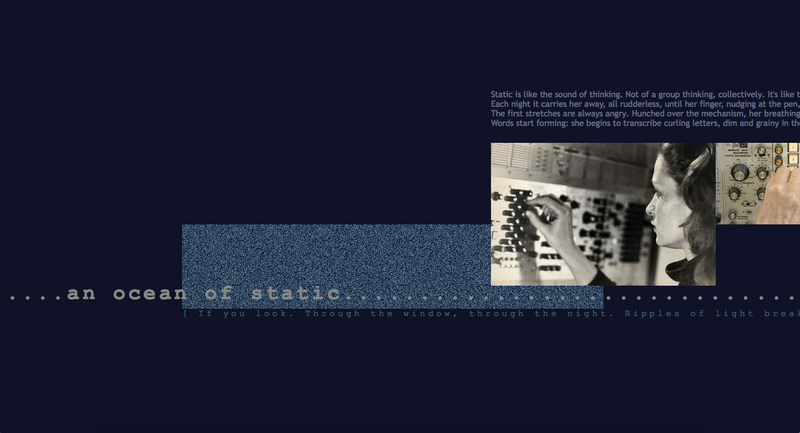 15Within the wireless writing apparatus, the listener becomes a human interface, translating from static into sense. Détourning McCarthy, of the listener we might say: each night the static ['recoils with a wail', 'rolls back in crackling waves', 'carries her away, all rudderless'], until her finger, nudging at the ['dial', 'pencil', 'pen', 'cursor'], can get some traction on it all, some sort of leeway. 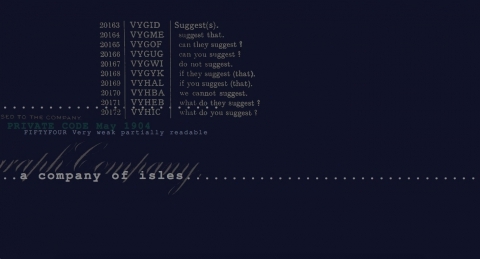 16In this sea of dubious decipherability, the listener serves as a cipher, a vessel, a Marconista (as wireless operators were known), a hybrid creature enacting a hybrid role —between that of a secretary and that of a medium. ['Her breathing an extension of the frequency of the air she’s riding on'], she gets the first quiet clicks. 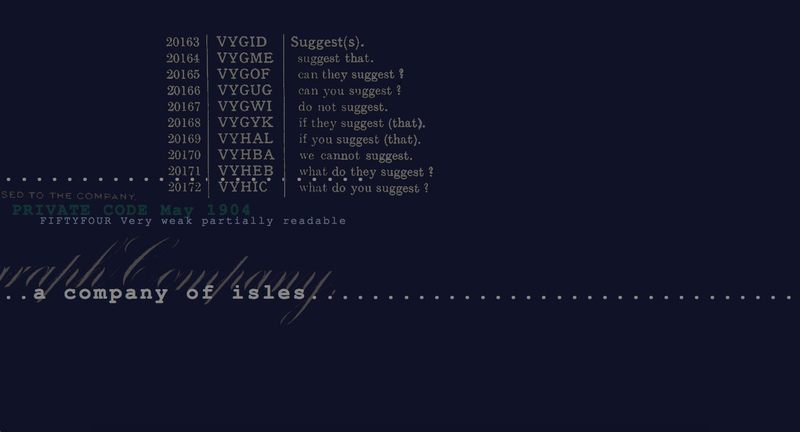 Words start forming: ['she jots down the signals as straight graphic lines, long ones and short ones', 'she begins to transcribe curling letters'], dim and grainy in the arc-light of her desktop12. 17The Marconista transcribes without understanding, from ear to hand. Both mouth and eye are erased. Thus wireless creates a blindness, an hallucination of meaning. Distance ['distracts', 'distorts', 'distends']. The ['heart', 'head', 'ear'] hears what it ['wishes', 'wants', 'needs'] to14. 15 Lisa Robertson, “disquiet,” Nilling, Toronto, Book Thug, 2012, p. 57. On the 22nd of February 1902, Marconi sailed westward from Southampton to New York accompanied by a team of engineers and wireless operators. No soundings were taken on this voyage. Noises were made. 2,100 miles from Poldhu, Cornwall, three dots were received. These were recorded on inker tape, and witnessed by the captain, leaving little room for doubt. 21This map presents the Certified Track of S. S. Philadelphia American Line Showing Points Where Mr. G. Marconi Received Messages From Cornwall, England. Aristotle (350 BCE), On Sense and the Sensible, trans. J. I. Beare, The Internet Classics Archive. [Online] http://classics.mit.edu/Aristotle/sense.1.1.html [accessed July 19th 2016]. Campbell Timothy C., Wireless Writing in the Age of Marconi, Minneapolis, University of Minnesota Press, 2006. Carpenter J. R., “Etheric Ocean,” Electronic Voice Phenomena. [Online] http://www.electronicvoicephenomena.net/index.php/jr-carpenters-etheric-ocean/ [accessed July 19th 2016]. Deleuze Gilles and Guattari Félix (1987), A Thousand Plateaus: Capitalism and Schizophrenia, Minneapolis, University of Minnesota, 12th printing, 2007. Electronic Voice Phenomena. [Online] http://www.electronicvoicephenomena.net/index.php/jr-carpenters-etheric-ocean/ [accessed July 19th 2016]. Kittler Friedrich, “Towards an Ontology of Media,” Theory, Culture & Society, vol. 26, no. 2-3, March/May 2009, SAGE, Los Angeles/London/New Delhi/Singapore, p. 23-31. Hakluyt Richard (1598-1600), Voyages and Discoveries: The Principal Navigations, Voyages, Traffiques and Discoveries of the English Nation, ed. J. Beeching, London, Penguin Classics, 1985. Hoare Philip, “MH370: the Forlorn Bleeps Remind Us of the Vast Depth of the Ocean,” The Guardian, 8 April 2014, [Online] http://www.theguardian.com/commentisfree/2014/apr/08/mh370-bleeps-vast-depth-ocean-secrets-americans [accessed July 19th 2016]. Marconi Archives, Bodleian Library, Oxford University, Oxford, (UK). [Online] http://www.bodley.ox.ac.uk/dept/scwmss/wmss/online/modern/marconi/marconi.html [accessed July 19th 2016]. McCarthy Tom, C., London, Jonathan Cape, 2010. Murray J. and Thomson C. W. (1885), Report on the Scientific Results of the Voyage of H.M.S. Challenger During the Years 1873-76, London, By Order of Her Majesty’s Government. Navarro Jaume, “Wireless, Relativity and the Ether,” The Conveyor, 8 July 2013. [Online] http://blogs.bodleian.ox.ac.uk/theconveyor/2013/07/08/wireless-relativity-and-the-ether-byrne-bussey-marconi-fellowship-research-2013/ [accessed July 19th 2016]. Robertson Lisa, “Disquiet,” Nilling, Toronto, Book Thug, 2012. Sconce Jeffery, Haunted Media: Electronic Presence from Telegraphy to Television, Durham & London, Duke University Press, 2000. Telegraph Museum Archive Collections, Porthcurno, UK. [Online] http://www.porthcurno.org.uk/page.php?id=60 [accessed July 19th 2016]. 1 Friedrich Kittler, “Towards an Ontology of Media,” Theory, Culture & Society, vol. 26, no 2-3, March/May 2009, SAGE, Los Angeles/London/New Delhi/Singapore, p. 26. 2 “Etheric Ocean” has been performed at The Museum of Water, Somerset House, London (UK), 2014; The Other Room, Manchester, UK, 2015, and The Post-human, Cerisy, France, 2016. It has been exhibited at No Legacy, University of California, Berkeley (USA), 2016. This text is an adaptation of a paper presented at “Sound Studies: Art, Experience, Politics,” Centre for Research in the Arts, Social Sciences and Humanities (CRASSH) , University of Cambridge 8-10 July 2014. 3 Richard Hakluyt (1598-1600), Voyages and Discoveries: The Principal Navigations, Voyages, Traffiques and Discoveries of the English Nation, ed. J. Beeching, London, Penguin Classics, 1985, p. 301. 4 Richard Hakluyt (1598-1600), Voyages and Discoveries: The Principal Navigations, Voyages, Traffiques and Discoveries of the English Nation, ed. J. Beeching, London, Penguin Classics, 1985, p. 298. 5 J. R. Carpenter, “Etheric Ocean,” Electronic Voice Phenomena, [Online] http://www.electronicvoicephenomena.net/index.php/jr-carpenters-etheric-ocean/ [accessed July 19th 2016]. 6 Philip Hoare, “MH370: the forlorn bleeps remind us of the vast depth of the ocean,” The Guardian, 8 April 2014, [Online] http://www.theguardian.com/commentisfree/2014/apr/08/mh370-bleeps-vast-depth-ocean-secrets-americans [accessed July 19th 2016]. 7 J. Murray and C. W. Thomson (1885), Report on the Scientific Results of the Voyage of H.M.S. Challenger During the Years 1873-76, London, By Order of Her Majesty’s Government. 8 J. R. Carpenter, “Etheric Ocean,” Electronic Voice Phenomena, [Online] http://www.electronicvoicephenomena.net/index.php/jr-carpenters-etheric-ocean/ [accessed July 19th 2016]. 10 J. R. Carpenter, “Etheric Ocean,” Electronic Voice Phenomena, [Online] http://www.electronicvoicephenomena.net/index.php/jr-carpenters-etheric-ocean/ [accessed July 19th 2016]. 12 J. R. Carpenter, “Etheric Ocean,” Electronic Voice Phenomena, [Online] http://www.electronicvoicephenomena.net/index.php/jr-carpenters-etheric-ocean/ [accessed July 19th 2016]. 13 Marconi Archives, Bodleian Library, Oxford University, Oxford, UK, [Online] http://www.bodley.ox.ac.uk/dept/scwmss/wmss/online/modern/marconi/marconi.html [accessed July 19th 2016]. 14 J. R. Carpenter, “Etheric Ocean,” Electronic Voice Phenomena, [Online] http://www.electronicvoicephenomena.net/index.php/jr-carpenters-etheric-ocean/ [accessed July 19th 2016]. 16 J. R. Carpenter, “Etheric Ocean,” Electronic Voice Phenomena, [Online] http://www.electronicvoicephenomena.net/index.php/jr-carpenters-etheric-ocean/ [accessed July 19th 2016].